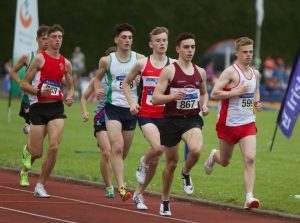 One club picking up a number of medals at last weekend’s Irish Life Health All Ireland Juvenile Track and Field Championships was Strabane Lifford – the only club on this island (as far as we know) with one foot in the north and the other in the south. The towns sit on either side of the Lifford bridge over the river Foyle, which connect counties Donegal and Tyrone. Showing that co-operation isn’t unusual in this part of the world, the current bridge built in 1964 and refurbished in 2005, was jointly funded by the Donegal and Tyrone county councils. “We came together two years ago. We were two small clubs based close to each other and it seemed a practical idea. It has worked out very well,” says Sharon Foley Gallen, the former Irish high jump and pentathlon record holder. Originally from Lifford, she now coaches with the expanded club. A total of 26 athletes in 44 events were competing for the club at the Irish Life Health Juvenile Championships and picking up five gold, six silver and one bronze in a variety of events. 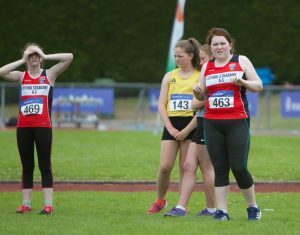 On a great day for the club’s hammer throwers, Cormac O’Donnell took U14 gold with a throw of 36.77m, while in the girls U14 age group Aine Marie McBride threw 42.51m for gold, narrowly beating her club mate Adrienne Gallen who threw 42.18. Just as close was the U15 hammer where Jude McCrossan with a throw of 48.96m, beat club mate Ross Henderson second with 48.46. In the U16 girls hammer, Olivia Cuskelly was third with 42.31m. All are coached by John O’Donnell. Finishing second in the W13 shot with 9.83 was Una O’Donnell, who is coached by Sharon Foley Gallen. Ashleigh McArdle won the U12 high jump, while Gareth Crawford won the U19 javelin with 57.32. Also in the javelin, coached by Damien Crawford, Ellie McCurdy finished second U13 with 29.95m. On the track, Alan McGinley was second in the U19 800m in 1 min 57 secs, while sprinter Harriet McCrossan was second in the U13 80m. And there will be more to come next weekend!